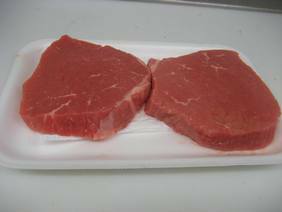 Eye of Round Steak, The Eye Is A Lean Steak, Great For Low Fat Diets. The eye of round comes form the outer part of the round, separated from the bottom round where the muscles are well exercised. 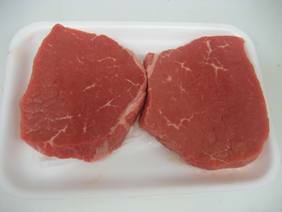 The eye is a small round shaped steak that can be used in stews and for cube steak. The eye is a very lean steak, great for low fat diets and because it is so lean more and more eye of round recipes can be found but is a tough steak that requires a tenderizing marinade before its grilled, broiled or pan-seared. 1. Trim off any excess fat, mix together the marinade according to its recipe. For best results place the eye of round steak in a resealable plastic food bag with 1/2 to 1 cup(250ml) of marinade, squeeze any air from bag, refrigerate 6-24 hours.